I dare you to. I mean it, though. I dare you insist that you BEG you to read this book! If you read just ONE book about nutrition this year, make it Eat The Yolks. It's here! Eat The Yolks by Liz Wolfe hits shelves TODAY. I've been looking forward to Liz Wolfe's book for a long, long time. I listen to her podcast regularly and traveled to DC for her nutrition workshop. The book, which I'm so grateful to have been given the opportunity to review, is a manifesto of a real foods philosophy, a compilation of the events and people in history that brought us to the modern health crisis. In the spirit of overturning popular myth and flawed recommendations, it is titled Eat The Yolks! Don't be fooled; this book is about so much more than eggs (although eggs are pretty darn awesome!). The yolks are a metaphor, and the title encapsulates everything in three simple words. "Isn't cholesterol bad for you?" No, eat the yolks. "Doesn't animal protein cause cancer?" No, eat the yolks. "Aren't calories (the fewer the better) all the matter?" No, eat the yolks. "Can't you get all the protein you need from plants?" No, eat the yolks. Release your fear of yolks, red meat, fat, cholesterol, and calories; the key to health is simply to eat real foods as packaged by nature. Click below to learn more and enter to win a copy! What is Eat The Yolks all about? This is not a diet book. This is about knowledge--about unlearning nutrition lies and discovering how to feed our bodies what they need. In the author's words: "We don't need more dogma or another diet plan. We need nutrition." "It's about knowledge. It's about choosing food that makes sense to your body, mind, and soul. It's about the intersection between good science, history, and common sense." Eat The Yolks is unique among the plethora of paleo books currently lining the shelves. Instead of "Here's the science, eat-this-not-that, meal-plan, recipes, tips and tricks" HOW-TO details, Liz focuses on answering the question of why: WHY are we sick? WHY are government recommendations upside down? WHY does conventional wisdom on health and weight loss fail in the long-term? In each section--Fat, Protein, Carbs--Liz begins by taking your hand and walking you through the history of how we arrived at this place of wild propaganda and misinformation. A tour through the research, the claimed findings, the historical context, the government regulations, the inventions, and so forth, makes it clear that a lot of the "conventional wisdom"that is still being spouted on morning talk shows is outdated, biased, shaped by Big Agra, and hurting us. In the final section, Nutrients, we learn about nutrient synergy--how nature provides us with all the nutrients we need--and the nutrients THOSE nutrients require to do their job--in the form of real, whole foods. Isolating nutrients in research or relying on supplements for nutrients only address a fraction of the complex role of micronutrients in our bodies. After reading the examples in Eat The Yolks, you can't help but marvel at nature's miraculous design. All of this, of course, is told in Liz's signature voice. Even while parsing scientific studies, she can make puns and jokes. She sneaks in (okay, "sneaks" is an understatement) countless pop culture references to keep the readers tuned in. She uses relatable metaphors to help you understand the biological processes. Her voice fills with compassion and respect when she talks about the roles played by plants, animals, and humans in the food chain. without fear of their natural fat or cholesterol content. "We've been tricked into thinking that something in a box with a list smacked on the side is, in a way, food. It's not. It's not food. It. Is. Not. Food." "Margarine is the greatest culinary and dietary atrocity ever to be inflicted upon our society." "Cholesterol is part of the [body's] healing response. LDL takes cholesterol to the site of the damage; HDL takes it away. If we posit that LDL is bad [...] we may as well, as Campbell-McBride puts it, call an ambulance on its way to an accident a 'bad ambulance' and an ambulance on its way to the hospital a 'good ambulance.'" "Plants'll getcha," she says (102). Plants have natural defenses, too! Plant and animal fats aren't as different as we think: "Olive oil is mostly monounsaturated, so that's what we call it, even though it also contains saturated fat." (35) GASP! Who knew?! And there's a LOT more where that came from! Go to EatTheYolks.com for further preview. Everyone. This book is for everyone. Granted, Liz's writing style may most appeal to women in their twenties and thirties, but the content is applicable to all human beings who eat food. So... everyone. If you avoid eating animal products for health reasons, this book is for you. If you still believe all the hype about calorie-counting and fat-fearing, then this book is for you. If you want to maintain a healthy heart and currently do so by eating whole grains and taking cholesterol-lowering medications, then this book is for you. If you already eat a real-foods/paleo diet and think you know it all, this book is STILL for you! Even though I've been reading this stuff for over two years, I still learned so much from Eat The Yolks. First, it's astounding to have it all in one place, page after page, chapter after chapter. Further, there are so many fine historical details that Liz uncovers, which help put the pieces together and motivate me even further to take control of my plate. This book is NOT for you if you're looking for a HOW-TO on real-food/paleo eating. This book is not going to give you a list of yes/no/maybe foods, nor is it going to give you a list of tips for planning meals, dining out, or balancing your macronutrients. 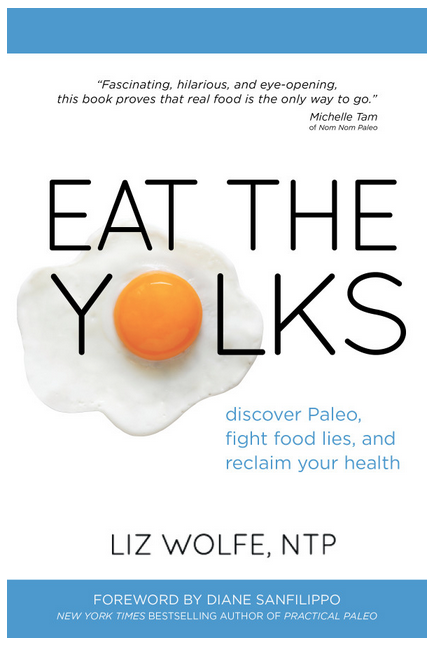 There are plenty of good books out there that do provide this information, but Liz's focus in Eat The Yolks is on giving you the foundation of knowledge, the information that will get you interested, skeptical, angry, and INSPIRED. I've been eating this way for a while now (in fact, the book release falls during the week of my two-year paleoversary! Yay!). I generally know what to eat, how to maintain it, and, why it matters. Still, upon reaching the book's conclusion and turning the last page, I was nearly brought to tears. I was motivated to take my own real-food lifestyle FURTHER by considering factors beyond my current scope. To seek out local farms, to take on a concern for the health of the topsoil my food grows in, to vote with my dollar, and to share my newfound knowledge with my friends, family, and YOU. Think this book is for you? Want to WIN a copy?? One lucky reader will receive a free copy of Eat The Yolks by Liz Wolfe! OR choose a quote from above and share why it resonates with you! For a bonus entry, tweet about the giveaway linking to this page. This may be done up to once per day. Giveaway will be open from 2/24/14 - 3/10/14 3/14/14, concluding at midnight on Friday night. Participants must be 18 or older to enter. Winner will be contacted and must claim prize within 3 days of contact. comprehensively overturns every nutrition myth that has been clouding public perception of what real food is. Liz wolfe aims to stem and reverse the current (downward) trajectory of human well-being, all by instilling in the reader an appreciation for nutrition as nature intended it. This book replaces popular lies with the knowledge that empowers you to reclaim your plate and, subsequently, your health. "[The] powers-that-be had their chance to shape America's health for the better, and if the last few decades of health disasters are any indication, they failed. Miserably." Dare YOU to eat "fearlessly and appreciatively." Disclaimers: The above post may contain affiliate links. See disclaimer page for details. I received a free copy of this book for review, but the opinions expressed above are, as always, 100% my own.